This post was written for Sign Link Magazine. The full article can be found here. I write this in an attempt to put to bed some of the misconceptions surrounding Neon that are put out there, generally by LED using companies, that have no knowledge or experience of Neon. I feel it is a sad state of affairs when something that has been an integral part of the industry for so very long, and is one of the few last bastions of hands on skill within the sign industry has completely false, un-researched information published, that can sometimes verge on the ridiculous. This is normally combined by something pious about how environmentally friendly LEDs are, which considering they are generally imported across the planet and can contain arsenic, lead, gallium and are believed to cause eye damage, is not necessarily the case, but I am not here to badmouth a product that is useful and clearly has its place in the industry. 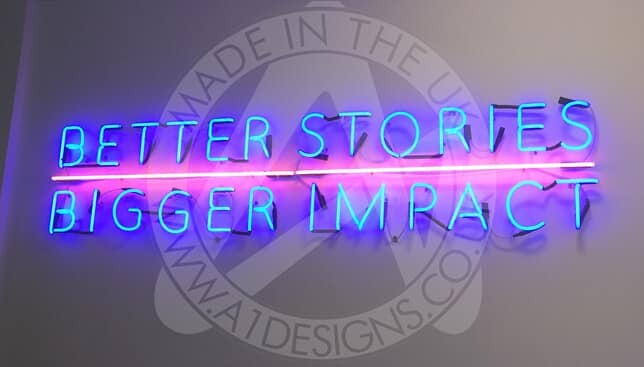 As a company we manufacture all types of signage and work with LEDs, so have a sound understanding of the industry, we have been involved with Neon for over 40 years and manufacturing as a company for around 35 years. There are many statements that have been put into press about Neon that are not accurate, please see some of these below, with the truths revealed after each one. Glass Neon, the only true Neon product in existence, does not burn fingers. Correctly assembled and installed, Neon is perfectly safe to touch. The electrodes do get warm, but won’t burn should you touch them, the electrical connection itself should always be covered with rubber caps, called shrouds or electrode sleeves, insulating the electrical connection along with any heat given off. There are a few misconceptions here. 1 – The first is that an LED Neon alternative product has the same look and feel as real Neon. From a distance, you may be forgiven for not knowing whether a sign was real Neon or LED Neon but up close there are many distinct features that make them different. Neon is glass and LED alternatives are made from either acrylic or rubber like substances depending on the quality. You cannot create the same feel as Neon with anything other than Neon. 2. “The technology is more durable than traditional Neon signage”. Neon has a manufacturer’s predicted lifespan of 45- 50,000 hours. However, it can last much longer if installed correctly and manufactured to a high quality standard. A great example is a sign found in America several years ago that had been running for over 70 years. Search Neon running 77 years on Google. When talking about durability, the material that tends to house the LED Neon products is more durable than glass. But this durability applies only to the sign being dropped or struck. Glass can be broken. We admit that Neon signs are not indestructible. When packaged correctly and when a reputable courier is used, there is no worry about a sign arriving intact. If your sign did arrive broken, then the sign would likely be covered under a warranty and any repairs would be made as soon as possible. If you take care of a sign, there is no reason why Neon is not a viable option. When it comes to installation, any sign engineer that is used to handling it will rarely break any sections if any at all. We also have glass everywhere in our homes, we drink from it, windows are made from it and ornaments displayed on shelves are formed from it. If we are not worried about these unexpectedly breaking and have not replaced them all with plastic copies, why should a Neon sign be any different? 3. “Because they are low voltage, they run for longer”. Voltage has nothing to do with life expectancy. Voltage applies to the power needed to ignite and run the sign. Neon is made so that it can run at high voltages, there is no strain put on the product by doing so. Neon can also be run at low voltage, however this again does nothing to the life expectancy when compared to high voltage. 4. “LED alternatives are cheaper”. As manufacturers of both real Neon and LED imitation Neon, we are in a unique position to know the ins and outs of both. Because of this, we can say without a doubt that this is not true. If a sign is purchased directly from us, then an LED version is more expensive than the Neon. The material costs for an LED version is far more than the material costs of Neon, also the time to manufacture is much less for a skilled glass bender than to round the faces of the acrylic, insert LED’s, fix the backing and then apply vinyl around the edges. The durability of Neon was addressed above, but with regards to designs being too intricate, Neon tubes can come as small as 8mm in diameter, a skilled glass bender can then turn this into very detailed designs with lettering as small as 45mm high depending on font style. If a design is too small to be made in Neon then it will definitely be too small to make in LED Neon alternative with a stroke width of 8mm and a rounded face. Neon tubes do not leak the gas put in them, they are low pressure lamps (between 9mbar and 20mbar, atmosphere is around 1000mbar), if there was a hole or crack in the tube air would leak in and the lamp would slowly die and need replacing, as air destroys the lamps ability to function. Both LEDs and Coloured Neon tubes have light degradation over time, for Coloured Neon this can depend on the colour as some fade faster than other over time. However this generally only starts to get noticeable as the tube gets close to the end of its life expectancy. With a pure Neon section however, the light stays as bright as the day it was installed, generally only affected by environmental effects on the exterior of the glass. If a pure Neon section fails this can simply have its electrodes changed and be re-pumped. On the occasions where a tube is broken and does need completely replacing, new sections can be remade at low cost and at times can be remade in under an hour, meaning that it can be on its way back to you as quick as possible at a cost that would be lower than an alternative. While it is recommended that a specialist installer fit skeleton Neon, it can be done by people with a competence with electrical products. For those who prefer to have things made more simple, Neon can come pre-mounted on a variety of substrates, so that it can simply be hung on a wall and plugged in. Installing LED alternatives also requires someone with knowledge of electrical products if being mounted directly to a wall. As for regulations, they have been put in place for all electrical products and installations. While some may see them as “tedious”, we see them as a safety net; something that ensures your product will run smoothly and safely. This may cause people to shy away from Neon as they believe it always has to have a fireman switch, but those same regulations also state the forms in which it does not require one. Overall, there are many out there who do not know enough about Neon, or simply repeat something they have heard or read about it without researching first. Neon is not going to burn you if you touch the lettering. Neon can be used at touching height without a cover. Neon can be High Voltage or Low Voltage. Neon can be used internally or externally. Neon signs do not always require a fireman switch. Neon can be dimmed, flashed, chased and strobed etc. Neon may be fragile but if packaged and sent correctly, it will arrive safely. Neon has a life expectancy of around 45-50,000 hours, but can last a great deal longer than that. Neon Lettering can be made as small as 45mm high and keep its tubular look. Neon does not explode randomly. Neon and Argon Gas are both Inert Gases- they are not themselves poisonous. A Neon transformer‘s electrical current is less dangerous than the 240v, 30A (30,000ma) A/C ring main supply at home. it takes 30mA of A/C Power or 300-500ma of D/C to stop the heart. Neon transformers run at either 25, 35 or 50ma. Hopefully this helps to shed some light on the art of Neon manufacture and stops the claims that are incorrect about Neon, we have no problem with alternatives but it’s unfair to put a product down with incorrect information. Also from a business point of view why would you restrict your revenue streams and not provide your clients with an educated assessment of what is right for them, both Neon and the alternative versions have their place, as some designs lend themselves to one option better than the other. If you are in need of advice about Neon please feel free to give us a call we are happy to help, if we don’t know the answer we will try and find out for you.